How can I help with maths? Some children have an unusual and persistent difficulty in grasping numbers and number work. This specific learning difficulty is called ‘dyscalculia’. It can occur with or without dyslexia. For more information regarding maths learning difficulties and dyscalculia click here. • learning times tables off by heart. For more information about Maths difficulties, the British Dyslexia Association has published Maths Learning Difficulties, Dyslexia and Dyscalculia by Steve Chinn. He has used his extensive experience to describe successful approaches and practices that will help children succeed in mathematics. Callscotland.org.uk has published a ‘Wheel of Apps’ to support learners with number difficulties. They have kindly agreed to allow us to share this with you. Click here to see the Wheel. Here are some strategies for learning times tables that might help you help your child: We know plenty of children who have never mastered their times tables but managed to gain good marks at maths GCSE. Times tables are a learning exercise and if you cannot remember them it does not necessarily mean your child will not succeed in maths. There also are lots of ideas in the childrens section that you could look at with your child to find a game or strategy that they will enjoy. Use a song format of the times tables to play in the car. Learn just the main number facts. For example: 2x2, 3x3, 4x4, 5x5 etc. Then work out any others when they are needed using this as base. Put the table and the answers on cards and get the children to match up, play pairs or bingo. The BBC Bitesize site has many useful resources for maths. Click here to search for the maths topic. We have put some fun tips and ideas for learning these on the ‘For Children’ section. Harry’s magic tables was written by a mum to help her son with his tables using rhymes and pictures. You can buy it on amazon or download on kindle or tablet. Click here to find out more. Dragon box has some apps that have been recommended to us that 'make algebra feel like a game' Click here to read more. Penny a founder supporter of Dyslexia Assist has shared some videos she made with her son which are really friendly, she says 'from my own experience, I can understand why many children struggle with numbers, particularly with multiplication and division, and why so many close down their 'maths brain'. I was the invisible child at school, the quiet one labelled 'stupid and lazy'. 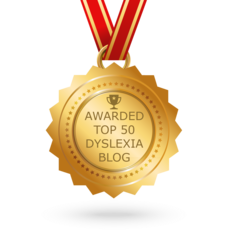 It wasn't until I was 16 years old, having struggled through school, that I was finally diagnosed with dyslexia. Fast forward 20-something years, I now have three children who are also dyslexic. I've always tried to maintain a positive attitude towards maths for their benefit, but secretly still loathed it. Multiplication Rules! materialised when my middle son, Harvey, asked "Why are they called times 'tables' when they look like a list?" In an effort to explain, I drew a grid and numbered the squares 1-15 – in each square, I wrote 2, 4, 6, 8, and so on. We quickly noticed a simple, repetitive, number pattern that applied to all the 'even' times tables (2, 4, 6, etc.). When we looked at the 'odd' times tables (3, 6, 9, etc.) an equally simple, repetitive pattern emerged. Suddenly, learning times tables had become much easier. ModMath is a free iPad app, developed by the parents of a child with dyslexia and dysgraphia to allow him to lay out mathematical problems neatly and legibly. Since it was first released around two years ago ModMath has acquired a reputation as a nice, easy to use app for laying out arithmetic on an iPad. It is particularly useful for learners with dyslexia, dyspraxia and dyscalculia, many of whom often have difficulty with laying their work out neatly. Version 2.0 has just been released and comes highly recommended.